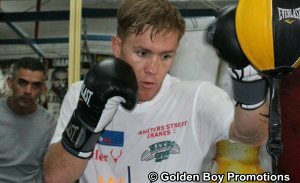 lightweight title challenger "Wild" Will Tomlinson hosted a Los Angeles media work-out at Westside Boxing Club on Tuesday, Feb. 24 before his championship bout against Francisco "El Bandido" Vargas in San Antonio, Texas on March 12. The title fight will also be televised live on HBO Latino® Boxing. Here is what Tomlinson and his trainer Nicolas Robledo had to say about training camp and his hopes for fight night on March 12. Downloadable fight footage for the fighters is available via FTP. Media may only use less than three minutes of footage. "This bout is going to get me a step closer to the direction I want to go, which is fighting for a world title. Vargas is ranked by the WBO and the WBC and a win over him will get me a shot at those ratings. "The sanctioning bodies know who I am and a win over Vargas will remind everyone where I belong. I will back amongst the best. "You are only as good as your last fight and good opportunities don't come by very often. When they do, you have to grab them with both hands and capitalize on the moment. "Vargas is going to be there to fight he is going to be in front of me and I welcome that, his style suits me. I want him to throw punches because he is going to get hit as well. I believe I will be throwing the faster, sharper punches. "I am going to control the pace of the fight, the movements and I am not going to let Vargas recklessly work me down. I am going to hit him hard and I am going to make him realize he is fighting someone that can assert his strength and power. "I am going to be fighting proudly for all my fans in Australia, all the Latino fans, all the American fans. I look forward to introducing them to "Wild" Will and putting on a good show on March 12." "We know Francisco Vargas is a very talented forward fighter that comes to fight and throws a lot of punches. We are going to stay focused on our countering and attacking. "Our main goal is to counter Vargas' punches. We have trained hard for him to be prepared for Vargas's style of fighting. Will is a puncher and loves to fight; he is going to put to on a great show. "Will is fast. His speed is going to be a contributor to his win on March 12. "We are fighting for titles, and this is a big fight for Will. He will put on a great show on March 12 and leave everything in the ring. His strength and his desire to win will win over the fans in San Antonio." Vargas vs. Tomlinson, is a 10-round NABF and WBO International Junior Lightweight bout is promoted by Golden Boy Promotions and Lejia*Battah Promotions. The HBO Latino Boxing telecast begins at 9:45 p.m. ET/PT is sponsored by Corona Extra and Mexico - Live It To Believe It!. The Freeman Coliseum doors will open at 4:00 p.m. CT and first bout begins at 4:00 p.m. CT.
service charges and are available for purchase at www.ticketmaster.com, all Ticketmaster locations, by calling 800-745-3000, or in person at the Freeman Coliseum/AT&T Center SE Box Office, Monday through Friday 10:00 a.m. - 5:30 p.m., or through Leija*Battah Promotions by calling (210) 979-3302 or emailing m@leijabattahpromo.com. For more information, visit www.goldenboypromotions.com, www.leijabattahpromo.com and www.freemancoliseum.com, follow on Twitter at @GoldenBoyBoxing, @LeijaBattahPr, @HBOLatino, @elbandido130, @WillTomlinsonAU, and become a fan on Facebook at Golden Boy Facebook Page, www.facebook.com/hbolatino or www.facebook.com/LeijaBattah, and visit us on Instagram @GoldenBoyBoxing, @LeijaBattahPr, @elbandido130, @willtomlinsonau.